Microsoft has made a massive about-turn today by backtracking on some of its earlier announcements concerning the Xbox One, specifically regarding its DRM features and compulsory daily connections to Microsoft servers. In a statement on the Xbox Blog, Microsoft tells us that it is making a number of changes to its controversial policies based on overwhelming negative responses from the community, confirming that we will be able to “trade-in, lend, resell, gift, and rent disk based games just like you do today”. This means that there will be no fee or restrictions on used games, something which outraged people all over the internet. However, these changes do come with a couple of drawbacks. Microsoft’s previously announced that it would be possible to install a game to the Xbox One from its disc and then play the game without its physical media, but the changes mean that the disc will from now on be required to be in the tray in order for a game to work. As well as this, Microsoft says “downloaded titles cannot be shared or resold”, meaning the ten-user game library sharing feature has been binned. Another change that Microsoft has made concerns its internet connection, which the company had previously stated would be required in order to ping servers at Microsoft once per day to allow the console to function. 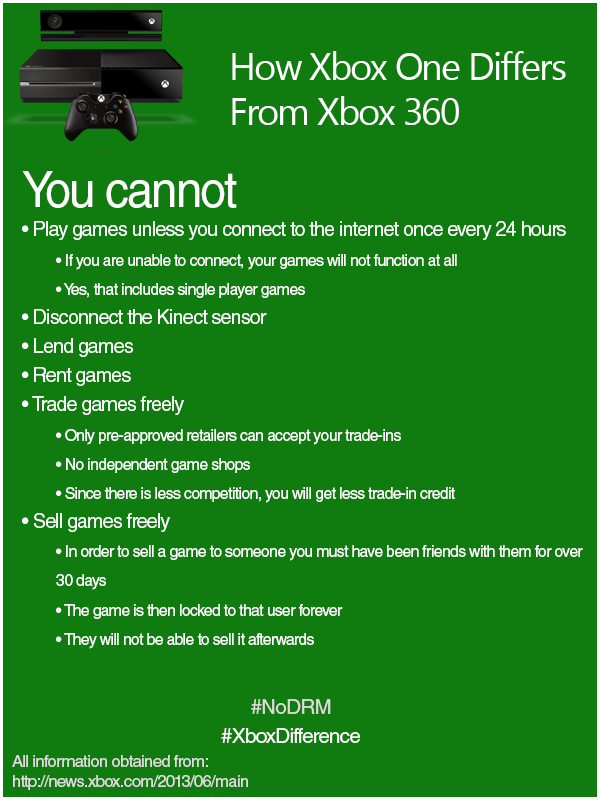 The blog post states “an internet connection will not be required to play offline Xbox One games” meaning that, just like the Xbox 360, you need never connect to the internet to play a disc based Xbox One game. Separately, the company has confirmed that the console will still require a day one software update, which will be the only time in its lifespan that an Xbox One must connect to the internet. It is clear to see that Microsoft has responded to people’s feedback and is trying to fix some of the massive PR problems that it has had for the last few weeks, which helped to portray Sony as the darlings of E3 in the eyes of many onlookers. While the changes to the previously announced policies bring the company back in line with their largest rival and show that the company is actively responding to user criticisms, the prevailing requirement of a constant Kinect connection and higher price tag than Sony’s offering may prove to provide difficulty for the firm when both consoles launch later this year.